Fulfill your need for balance and revitalization as you recline back and retreat from life's stresses with Panama Jack's Island Breeze 3-Pc Sling Chaise Lounge Set. Using top-quality materials to produce well-constructed casual outdoor furniture, Panama Jack also incorporates their laid-back, effortless island living style they pioneered back in 1974. This Sling Chaise Set consists of a powder-coated extruded aluminum frame in a rich Espresso finish, which is able to withstand extreme weather and climate conditions. Exclusive to Panama Jack, the sling material by Phifer resists mold, mildew, and fading, and will not slip or wrinkle. The versatile design of the sling chaise lounge also allows for stackability, so if your outdoor living space is limited, just stack and store away! 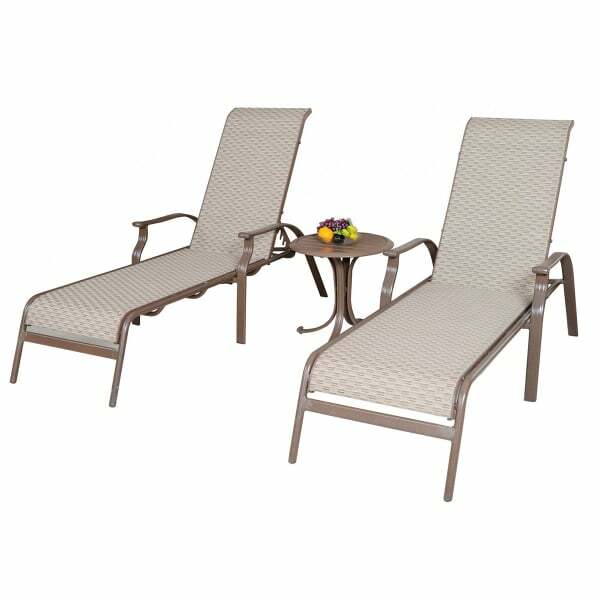 Whether it’s poolside or on the patio, the Island Breeze 3-Pc Sling Chaise Lounge Set is ideal for your outdoor living space, lending comforting support and tranquility. Three Year Woven Fiber "Viro Brand"
One Year Sling Fiber "Phifer Brand"